The mask purifies, detoxifies, and minimizes pores. It is perfect for clogged and enlarged pores. 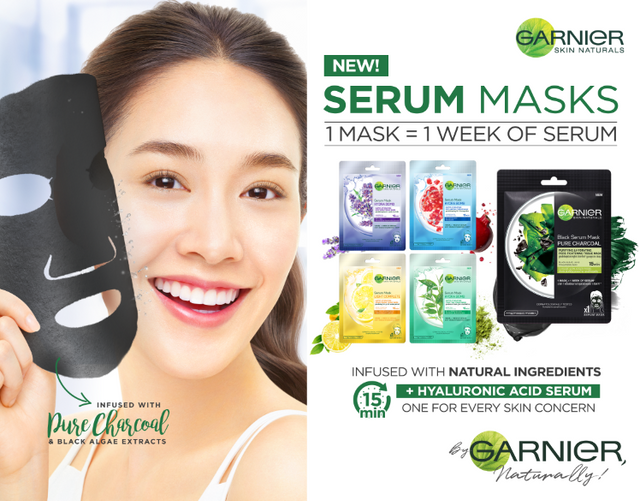 If you are selected, use Garnier Serum Mask you received from us as per instructions. I am really a big fan of masks as it is one of my ways to make me feel relaxed. May it be after a long day at work or after an intense session at the gym. I tried all types of masks, from korean to japan brands but I never tried using from a known brand. Garnier is one of the reliable brands here in the Philippines and knowing that they are expanding their products is a good news especially to a skin care freak like me. I was excited to use this and I am happy that it didn't fail me. The one I tried is the mask with charcoal and unlike other masks it just doesn't make my skin soft and supple, it also made me feel like it is squeaky clean. My only issue with this one is it is a bit wider than the usual mask so maybe it will be better if the size will be longer/more narrow but nonetheless, I would definitely repurchase this using my own money and seeing that it has a lot of variants made me excited too. I am always G for Garnier. Definitely a 10/10! Who doesn’t love black? I do! And I love that Garnier has this unique black mask. The mask indeed purifies, detoxifies, and minimizes pores. They said It is so perfect for clogged and enlarged pores which is all great for people who had breakage or too oily skin like mine. Infused with Hyaluronic Acid Serum and Charcoal known to help draw out impurities without drying out the skin. Charcoal draws out stubborn dirt, oil and impurities from the skin, while black algae extract, LHA and hyaluronic acid refine pores and skin texture and leave the skin moisturized. The formula is paraben-free and suitable for all skin types, even sensitive ones. Indeed you got what you paid for and much more. an affordable mask yet gives you so much benefit is a bomb! Come and haul some mask now! Indeed and I'm so sure that you would love it so so much like I do. The packaging is really nice though bigger than normal masks. Good thing that there are like some cuts like in between chin and cheeks which make it easier for the mask to fit your face unlike other brands. Not sticky on my face and I felt that my face became smoother the next morning after I used the mask. Though I cannot tell if there is really a great effect when it comes to hydration and oil control since I just used it once. For the price, not too expensive not too cheap, it's on normal price range for masks. But overall, I love this mask. This charcoal mask is amazing! It is my first time to try a charcoal mask and surprisingly it works well with my skin even though I have sensitive skin. I used it before going to sleep and it does wonders for clearing away stubborn junk in the pores, and after it has been removed, it leaves the skin super soft and smooth. The mask has a lot of serum in it hence I used some of it on my neck. The following morning my skin was soft and supple. Will definitely recommend this mask! Great product!